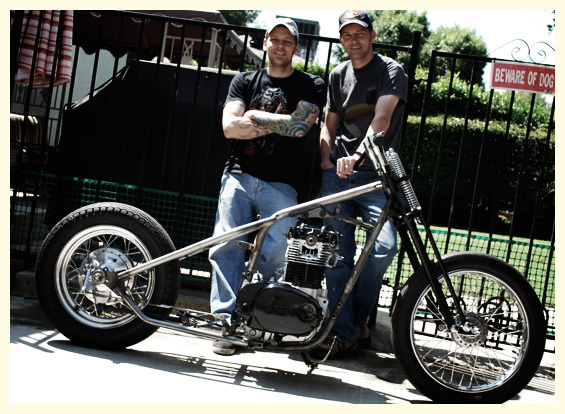 Welcome to Chappell Customs featuring the custom built motorcycles of the Chappell Brothers. We are Rob in Ontario, Canada and Chris in Los Angeles, California. Our goal isn’t to re-invent the wheel on each build but to create unique ride-able bikes with custom flair and extreme attention to detail. Having been around motorcycles since the age of 5 and taking apart everything we could get our hands on, I guess you could say we were gear heads from birth (or damn close). Growing up on dirt bikes as kids to Hot Rods, street bikes and racing as we got older, we’ve been around motors and doing it ourselves for quite a long time. Chris Chappell is also a licensed and certified automotive and motorcycle mechanic and has been for over 22 years now. It’s become a little harder to build together over the last 15 years (when Chris moved to L.A.) but we make due with trips back and fourth, skype calls from the garage and tons of emails and phone calls. Our building and fabricating passion has never left us and we continue to build bikes in every bit of spare time we have available. We’re glad you’ve taken the time to search us out on the internet, or stumbled upon our website from some other source. The builds within represent countless hours in the garages of the U.S. and Canada – we hope you enjoy the bikes as much as we enjoyed making them. Watch for them on the streets of a neighborhood near you. Interested in a build for yourself? We can always discuss new projects and get you added to the list, just use our handy contact form to get in touch. Cheers!